If you’re reading this it’s because I didn’t make it. 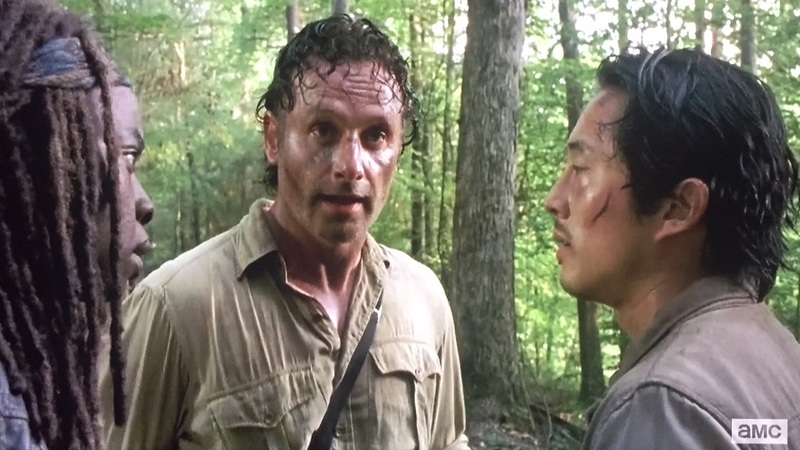 We rejoin Rick and company trying to manage the herd as all but Daryl, Abraham, and Sasha sprint back to Alexandria. Rick peels off alone to try and head off the herd headed back to Alexandria while Glenn and Michonne take a group of Alexandrians to try and make it back. We’ve had some speeches in the past about how the Alexandrians weren’t prepared for reality. How Rick’s group would need to teach them the hard way. Never has that contrast been more real and consequential as in what happened to this small group led by Glenn and Michonne. By the time they make it to a small town to seek shelter from the herd one has been shot in the leg and needs help, one has a sprained ankle and needs help, one died fighting walkers, one let his guard down and was bitten, and two ran off and got themselves killed. These people are not prepared for the task at hand. Once in the town and hunkered down in a pet shop, Glenn devises a plan to distract the walkers and allow everyone to escape. This self sacrificial nature is something we’ve come to love in Glen. He is always the one to step up and get something done so that others may have a chance at survival. He always has a forgiving heart, as evidenced by his treatment of Nicholas. He embodies the type of person I think we all hope we would be in this type of a scenario. Seeing him die was one of the more heart-wrenching moments in the shows history. Even more so, perhaps, than watching the governor behead Herschel in season four. No doubt everyone will blame Glenn’s death on Nicholas. I’m not saying that’s wrong, but what I saw in Nicholas leading up to that moment was a pure manifestation of the effects of guilt. Guilt rarely leads to complacency. Most of the time it will either drive you to resolve issues in your life and seek redemption, or it can bury you under it’s weight and sink you into depression or insanity. Think for a moment of the guilt Peter felt when he denied Jesus (Luke 22:61f), and the guilt that Judas felt when Jesus was arrested (Mt. 27:3-5). The former turned and later encouraged his brethren. The latter killed himself. Nicholas was unable to overcome his guilt. We could see him making efforts to forget the past and move forward. Glenn was helping with that as best he could. But in the end, Nicholas could not live with himself knowing what he had done in the past. I felt the actor playing Nicholas did a commendable job relaying that emotional whirlwind despite being a character everyone hates. I doubt many people minded him being out of the picture, we just wish it didn’t mean the demise of one of the more beloved characters on the show. This episode dove deep into the contrast of choices. The choice of Daryl to race back to Alexandria or continue leading the herd away. The choice of Rick to ‘let it be’ at Alexandria while he hears gunshots echoing in the distance, or continue his plan to divert these walkers. 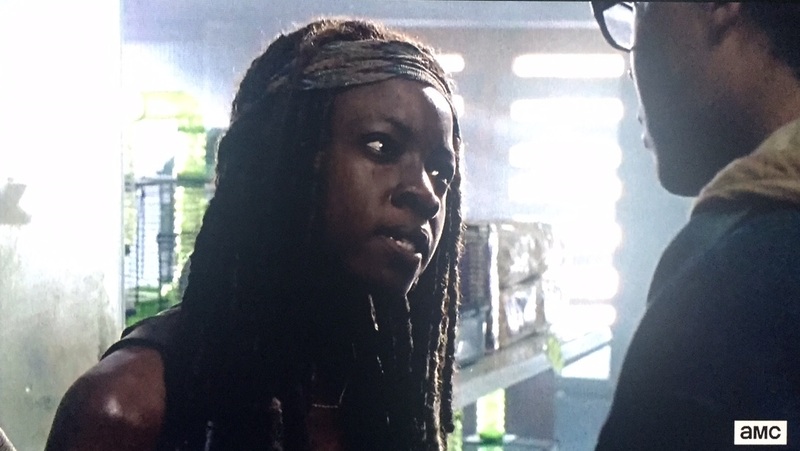 The choice of Michonne to stay with the Alexandrians despite Rick’s admonition to leave them if need be. 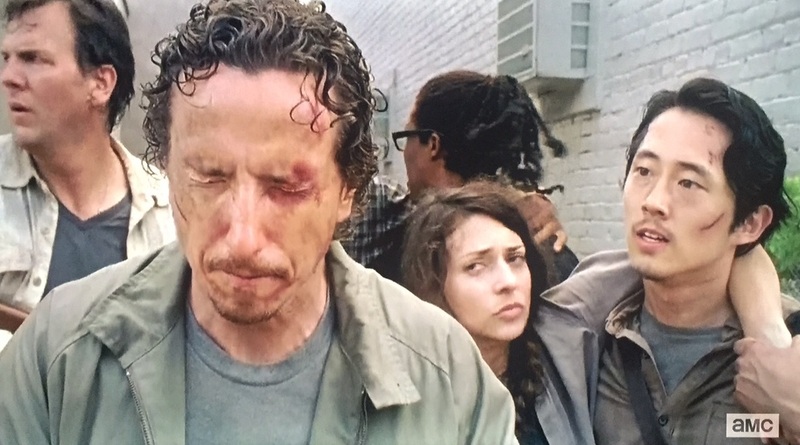 The choice of Glenn to encourage Nicholas to be better than he was despite that leading to his death. This episode further affirms the fact that every choice made in this world has the potential to be a disastrous one. Few episodes of any tv show provide continuous tension and meaningful character interaction. Not a single breath of dialogue in this episode is wasted and virtually every character has a “moment”. I felt genuine suspense at the necessary moments, and genuine heartbreak at others. Yes, a fan favorite died. But he died in a way consistent with his character and the episode has additional quality to offer aside from that. It was excellent. I went back and watched Glenn’s death scene again out of a bit of curiosity. On first viewing an optimistic mind might think that Nicholas landed on top of him and the guts we saw being ripped apart were not Glenn’s, but Nicholas’s. 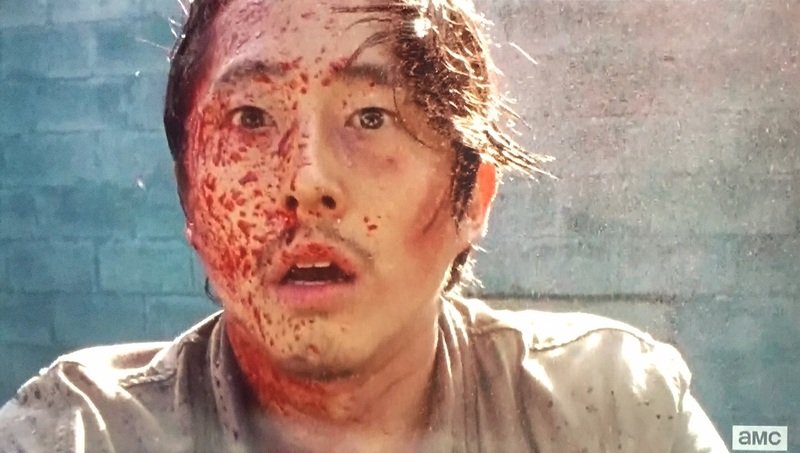 Watching specifically that shot again removed my optimism as it definitely looks like Glenn being torn apart. However! I did notice a couple of curious things. When they fell off of the dumpster they fell away from it so that when they landed their feet should have been towards the dumpster. But, as the camera goes to a top-down view you can clearly see Glenn’s head near the corner of the dumpster. How did it get there? Also if you look closely at where the walkers are doing their mutilating, it looks like it is coming more from Glenn’s waist or legs based on where his head is. This would be contradictory to what we saw, or think we saw, in the close-up. Now you might chalk that up to simple shoddy camera work if not for some curious comments regarding Glenn on Talking Dead. For one, Glenn was not mentioned in their “In Memoriam” segment where they pay tribute to all those that died in the episode. Why not? Secondly, Scott Gimple explained in a letter written specifically for the Talking Dead audience that we have not seen the last of Glenn in some way. What does that mean?!? Long story short, despite how convincing Glenn’s death looked on screen I wouldn’t be surprised if we are being duped. I would love to hear your thoughts on the episode as a whole, but also specifically on the Glenn’s death. What did you think? Yep, you kinda hit on my theory than Glen is alive. Several other interesting things. Glen didn’t appear on Talking Dead after his ‘death show’. Obviously that isn’t automatic but that has been the routine in the past for bigger characters. Also when Nicholas says “Thank You”. It could be interpreted as thanking Glen for his forgiveness and trust and to show him he was going to sacrifice himself. Perhaps this was Nicholas finally taking the incentive and saving Glen. Of course it could just be that Nicholas simply screwed up AGAIN! Regardless, it is a fun conversation to have. Yeah, good thought on Nicholas’ “Thank you”. I definitely agree that he’s thanking Glenn for his forgiveness. Like a final goodbye. Glenn might be the only person in this world that wouldn’t have shot Nicholas back in the woods once he got the upper hand, much less start to bring him along and give him chances for redemption. Thanks for the comment and for reading, Keith!